Acetate is a common anion and fundamental to all forms of life. When bound to coenzyme A, it is central to the metabolism of carbohydrates and fats. It is acid form, acetic acid, is produced and excreted by acetic acid bacteria, such as Acetobacter genus and Clostridium acetobutylicum, which are found universally in foodstuffs, water, and soil. Acetic acid is also a component of the vaginal lubrication of humans and other primates, where it appears to serve as a mild antibacterial agent. Acetic acid is the main component of vinegar, and extensively used in food, dyes, paints, glue and synthetic fibres. BioAssay Systems’ assay uses enzyme-coupled reactions to form a colored, fluorescent product. The color absorbance at 570nm or fluorescence intensity at 530nm/585nm is directly proportional to the acetate concentration in the sample. 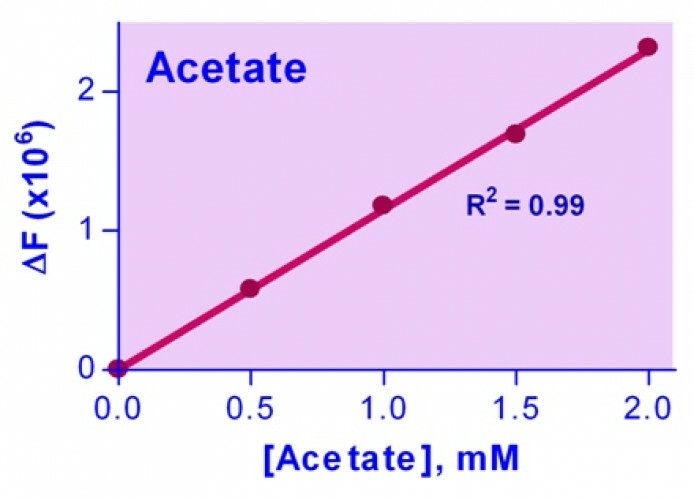 Applications For quantitative determination of acetic acid or acetate and evaluation of drug effects on acetate metabolism. 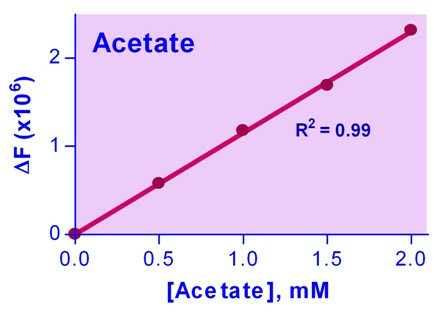 References Assay: Acetate in Microbe cell (Pubmed).